‘We started off learning how dance in the Zagreb Dance Centre. The Centre was located in the military academy in Zagreb. Most of our co learners were cadettes. There was us, the cadettes and a few more people like Biba and Mrs. Darinka. We said whoever wants to make a scene for the film is welcome to. 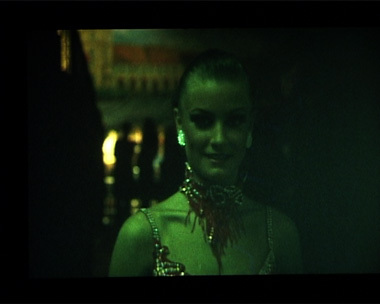 ‘In Time – Episodes‘ is a series of cinematic episodes based around the Latin American dancing schools and clubs of Croatia, Bosnia and Herzegovina, Montenegro and Slovenia. For two years, a small crew and I have been attending dancing lessons and competing at international competitions while proposing to make a film where we are all actors and producers. We archive everything on video, to use our own memories and the video archive as an aide memoire to chose moments that occurred in reality to transform them into cinematic events. This offer is open to everyone in and around the clubs. Each of the episodes focuses on an event and a retelling of this event, in the process experience is turned into narrative. The project sets up a negotiating field between the choreography of grammar, its expression in discourse and history and its performance in the narrativisation of experience. Or story telling.